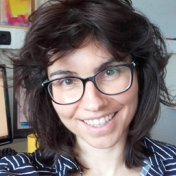 Kristina's current work is on language and rules of inference, in the lab of Alessandro Treves. She applies methods for identifying optimal models of brain connectivity with parameter estimates of simultaneous and lagged connections among brain regions. Her interest in fundamental questions concerning the nature of time and cognition has led her to research in cognitive neuroscience, but she loves art creation as much as syllogistic inference.